Geek Girl Stuff is a women-owned, family run business located in Portland, Oregon. 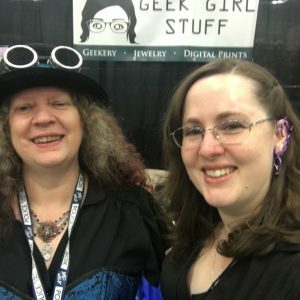 We specialize in hand crafted goods of a geeky nature and stock wares ranging from art prints, etched glass, and jewelry to dragon eggs, elf ear cuffs, and 3d printed geekery. We’re always experimenting and expanding with our greeky craftiness, so stay tuned for more goodies! We attended Rose City Comic Con in Portland, Oregon for the very first time in September of 2014 and fell in love. Women and girls in the gaming and geek industry just don’t get enough love. With that, we went into business and formed Geek Girl Stuff. We had our first Artist Alley table at Rose City Comic Con in late 2015. A very humble start, and it was heartening to see the support we received. In early 2016 we began making elf ear cuffs, circlets, dragon eggs, and we had a table at Artist Alley at Wizard World Comic Con. We received amazing and overwhelming support and it was so heartening. With that, we are continuing to expand our crafted goods and looking into more conventions to set up shop. In the mean time, we have an online store! Items ship out of Portland, Oregon, and ship within 3-5 business days. If you’re local and want to arrange a pickup, we can do that, just drop us a line!